These flat, oval shaped abalone beads measure 8 mm x 14 mm. 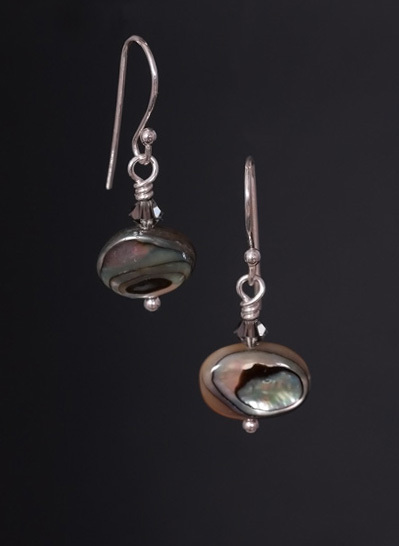 A natural shell component, so no two beads are exactly the same, in iridescent shades of turquoise, silver and browns. Accented with a Swarovski crystal in black diamond. Kept simple in design. Earwire hand formed in sterling silver. 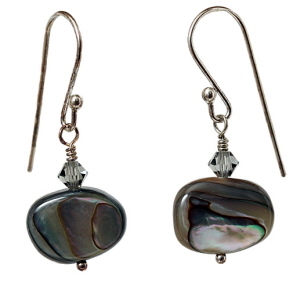 Earrings measure 1⅜ inch from top of earwire to bottom of dangle, ½ inch wide.